A fast growing non-evergreen climber. Clematis montana 'Warwickshire Rose' smothers itself in small, fragrant, shell-pink flowers with yellow centres during May and June, offset beautifully against the dark green and reddish-bronze leaves, the colour of which intensifies during the summer. When John Williams of Warwick spotted a seedling developing in a paved area of his garden, he immediately recognised something distinct. Allowing this to grow to maturity, his appreciation expanded to the extent that he named it after his town and mothers first name. 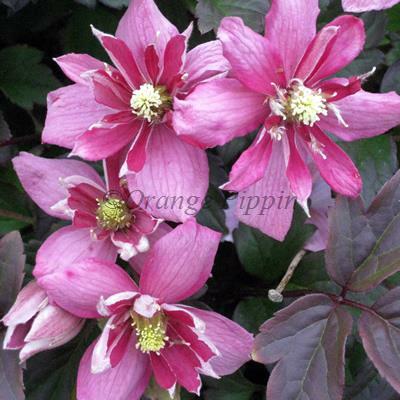 This hardy, robust Clematis is ideal for covering large fences, buildings and can be grown up a tree.